There are not enough words that I can use to describe how awesome this trip was. The scenery, the excitement, the commraderie that developed, the food, the hikes and waterfalls, the knowledge and expertise of the guide Drew and, his swamper Laurie. I was in tears having to leave the river that last day and, would not hesitate doing this same trip again!!!!!!!!!!!! 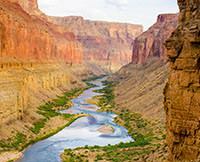 The Grand Canyon 6 day trip is definitely the best for Whitewater Rafting on the Colorado River.